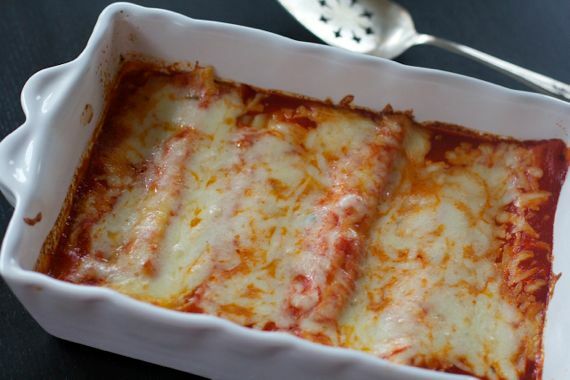 Manicotti is my husband’s favorite red sauce Italian dish. I’m not sure why I only seem to make it once every few years. Part of it might be that it’s so good that I’m afraid I’ll eat the whole pan in two days. To ensure that it didn’t happen, I shared the manicotti with another couple. Men don’t seem to have the overeating fear gene, because we watched them eat gigantic portions and go back for seconds. I made two boxes and a box of stuffed shells and in two days it was all gone! I used great restraint, but in writing this post at 11:00 at night and looking at this picture, don’t tell anyone that I snuck downstairs to have another bite. I wanted to cook manicotti this week because I am hosting Red to Remember for World AIDS Day tomorrow, and this is my main dish. I chose manicotti for this event because it’s Italian comfort food, for a week that need comfort. The days leading up to World AIDS Day is my time to remember those I have lost, especially my brother, and to grieve. Grieving is a process that doesn’t just start big and then diminishes over time. If the loss is big, it will stay big, but go undercover. Losing someone can be devastating, especially when it’s long before their time, especially when they mean so much to your own identity. I didn’t know how to exist if I were not my brother’s sister. It was the only stable role I ever had. Growing up, all the other members of the family came and went, including my mother and my father. In his book, A Grace Disguised: How the Soul Grows through Loss, Jerry Sittser writes that losin someone is like losing an appendage, and part of the grief is losing the identity of being someone’s sister, wife, mother, child, etc. I was constantly losing part of my identity. When I was three years old, my mother left for a while and I was no longer my mother’s daughter. She came back and my father left and I was no longer my father’s daughter. During the early years of childhood, my mother took us away from everyone and I was no longer my aunt’s niece or my grandparent’s granddaughter. Thankfully I was never separated from my brother. I was always my brother’s sister. He was always his sister’s brother; we could depend on that relationship and I could depend on the reality check it gave me. His absence was especially painful, because he was the one person who could straighten out an untruth or insecurity by always letting me know my value. The weight of his absence was magnified the presence of our mother. He was always there to counter her words, reassure me of my basic goodness. I did the same for him. My brother died in my living room during an rerun of I Love Lucy. I never called anyone in the family. They wouldn’t come to help me in those last hard weeks. They didn’t call to check on us. We found ourselves once again in a sad dilemma not able to be someone’s son or daughter, only to be a brother and a sister, roles we both found comfort in. Food is comforting, and cheesy food especially so. I have no qualms with that. Some weight loss type groups will try to convince us that food should just be food to live, and not to enjoy and never to eat for comfort. I whole heartedly disagree. Eaten in moderation, good food made and served with love can be just what the doctor ordered. I’m not talking about food addicts that never taste food, but just blindly eat. I’m talking about sitting at the table in front of a beautiful dish of cheesy manicotti, with rosemary bread, and arugula salad dressed with lemon and pecorino, a glass of big fat cab, and savoring every bite as the cheese pulls away gooey, and the food goes right to the epicenter of your being, making you feel loved and valued. People from every culture and nation know this. Food is the first thing people bring upon a death. In the South, there are traditional funeral dishes which include many casseroles. 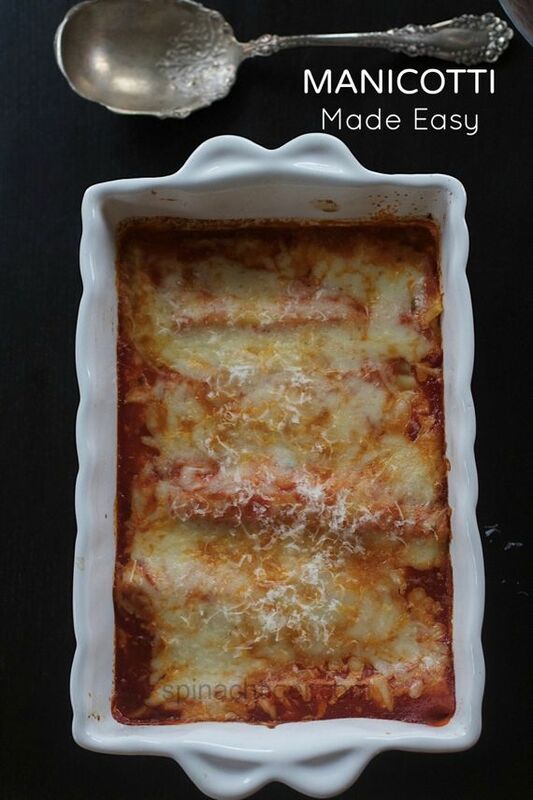 In an Italian family, casseroles include lasagna, and manicotti. I like to use a very simple basic tomato sauce and three cheeses. I only use San Marzano tomatoes because in my own blind test taste, there was a difference that makes the extra few dollars worth it, and I use pecorino romano because of it’s saltiness up against the other more bland cheeses. The challenge is in stuffing the cylinder shaped manicotti shells. A pastry bag makes all the difference. You can also assemble the manicotti and refrigerate the day before until you are ready to bake. Just remember to take them out an hour before baking, and once baked, give it twenty minutes to rest. Tell me, what dish do you take to a funeral? Does your family have any funeral traditions? Puree the tomatoes, by crushing with hands and then taking through a food mill. If you use good San Marzano tomatoes, you should get a lot of puree, very little waste. Heat onion and garlic in olive oil. Add in pork chop and brown on both sides. Add in tomatoes, salt, pepper. Reduce heat to low until the sauce is reduced to a thick puree, about two hours. Remove, garlic, onion and pork chop before using sauce for manicotti. The pork chop is an option and used for extra flavor. Mix ricotta cheese, pecorino, mozzarella cheese, egg, salt, pepper, nutmeg together. Add in parsley. Boil large pot of salted water. Cook manicotti shells for five minutes, no longer. Drain. Cool. Using a pastry bag, fill each manicotti with ricotta cheese mixture. In a baking pan, add in some tomato sauce, enough to cover bottom of pan, line up the manicotti, top with mozzarella cheese. Bake for 30 minutes or until the cheese is melted and bubbling. Allow to cool for 15 minutes prior to serving. I know loss myself…so long ago, but still they are in my heart. I meant “precedent.” Jeesh. That was a Freudian slip. I felt the US President had completely ignored the cause at the time. To have to bear all that without parental support must have been hideous. I found those early years of AIDS insane and people behaved so unpredictably. There just was no president. Your story is both sadly and sadly familiar. What a beautiful huge dish of perfect comfort food. And I’m all about a big fat cab. The recipe deserves the 5 stars, but your narrative deserves 5 ♡♡♡♡♡! That is a beautiful dish! So flavorful and comforting!